If you’ve recently passed by our new production headquarters on Riverfront Parkway, and noticed a consistent plume of steam from our rooftop… you might have guessed it… we’re making whiskey! Although it’s easy to give credit for this accomplishment to the distillers who are making the product, the truth is, we were just a small piece of the puzzle. So, as we quietly grind, ferment, distill and fill barrels, we find time to reflect and remind ourselves who really deserves the credit for where we are today. In late 2015, we officially started the project’s “design phase” with our committed partners: Cogent Studios, EMJ Corp and Vitok Engineers. Much like designing a whiskey recipe, this phase collected the ideas, designed a target, and mapped how to get there. For 12 months, we waded our way through the countless calculations, schematics, permits and diagrams necessary to make our plan a reality. By the dog days of summer, our patience was stretched as thin as the schedule, and the risk of any lingering unanswered questions was outweighed by our collective desire to just build the damn thing. So that’s what we finally did. 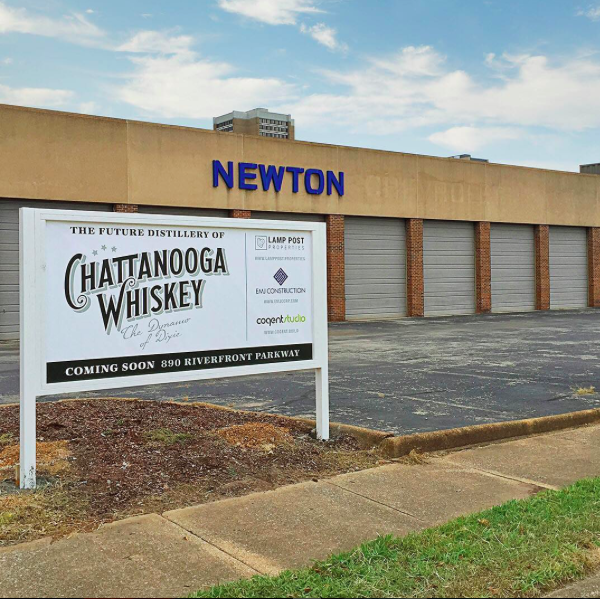 In August 2016, the historic Newton Chevrolet building finally came back to life in a cloud of dust. There’s nothing more exciting than seeing heavy equipment and physical work finally happen, but there’s also nothing more humbling than a post-demolition job-site; the only thing you can think of is how long it will take to fill in the empty space. So we kept building. By January 2017, it was time to replace some of the building’s old automobile trade-relics with some (shiny ones) of our own: the kettle, fermenters and beer well. But despite the new equipment’s scale and luster, it’s unplugged presence was just a tease to the thought and smell of fresh mash; for now we’d live with the smell of bare metal (just OK). We now turned to the phase of the project where we’d fill our distillery skeleton with the guts and nerves necessary to bring it to life. It was in these late winter days that the real distillery came together. Day-by-day, heaps of stainless piping and conduit bolted, flashed and fused together to form a floor-to-ceiling maze. I’ll never forget peering into a fermenter as our first agitator came to life in a cacophony of metallic wavelengths. We had power! And when the distillation tower was finally erected and painted into something approaching iconic, we lowered the still through a perfectly-sized square of daylight in the ceiling. A beautiful moment and a culminating symbol of all the skills and trades it took to make our whiskey trade a reality. As the teams from T.S. Raulston, Adman Electric and W.J. O’Neil began transitioning to their next project, we looked at our new place; a building that no longer felt like an old car dealership but, rather, very much like a distillery. And we felt right at home. In late March, we finally fired up the 30 ft., 12 in. continuous Vendome still and haven’t been up for air since. Over two months of trials, errors, freak-outs, and sighs of relief, our amazing team finally “figured it out”. As of June 1, we’ve sweated our way through 175+ barrels of whiskey: already eclipsing (and a humbling reference to) what we’ve made in 2+ years at our Experimental Distillery on Market Street. 175 barrels might seem like a lot, or it might seem like a little, depending on your perspective. From ours, the starting point was small, so it’s a pretty big deal. In the midst of tinkering with our newer, larger equipment, it’s easy to forget that these recipes were born – one at a time – from those micro beginnings at our Experimental Distillery. As we scale these recipes up, we continue to write new “beginnings” for whiskies every day at our Market St. Distillery. 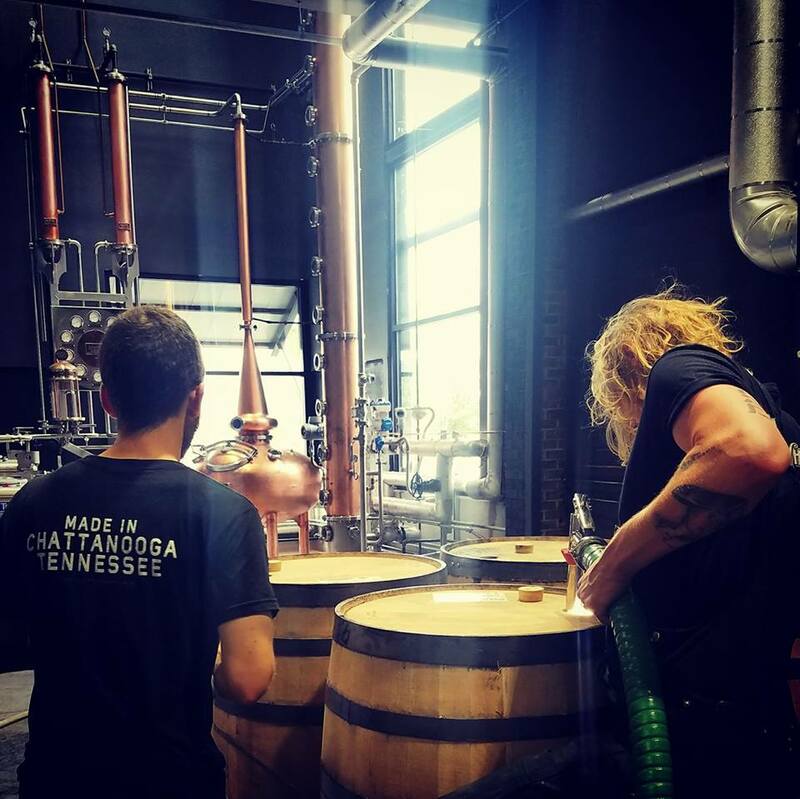 And after more than two years of research, developments, successes and second-guesses, we now prepare for our very first aged release: the Chattanooga Whiskey Experimental Single Batch Series. Batch number 001 – releasing this summer – begins to show you what we’ve been working on since inception. It is, in effect, a two-year lagged time capsule of our 2015 state-of-mind and spirit. Each year, we will release somewhere between 5 and 10 batches of whiskey and each batch will range from 1 to 10 barrels in size. Many will experiment with ingredients and mash bills; others will experiment with yeasts, barrels or finishing; all will be born from our 100 gallon pot still…handmade, one barrel at a time and uniquely Chattanooga Whiskey. While there will be no shortage of ideas, each batch is extremely limited in quantity. In other words, get it while it lasts, people. As we show off the whiskey we’ve made ourselves, we also look back at the credit we owe to our partners along the way. Without all of you, this would have been impossible. Our distillery proudly emblazes “Chattanooga” on its face because it’s yours just as much as it is ours. You got us here, and for that, we thank you. But the only enduring thank-you is one that channels all the work to this point into something that we hope will make you proud of working with us: our whiskey. When we accomplish that, it will be a great day to enjoy a Chatt Whiskey.